I have this setup as a 2-way mirror, so that both drives should hold identical data. Both of them are of exactly the same size and both have the same 30% of space free. I therefore do not understand why is it telling me to add more drives, when in fact there is still 30% free space left and I am using a simple mirror for identically-size drives with no parity or other advanced options? It tells you to add two instead of one, that's why two. in Powershell, where X is percentage of taken space for alert to occur. Documentation here. Not the answer you're looking for? Browse other questions tagged windows-10 hard-drive raid storage-spaces or ask your own question. 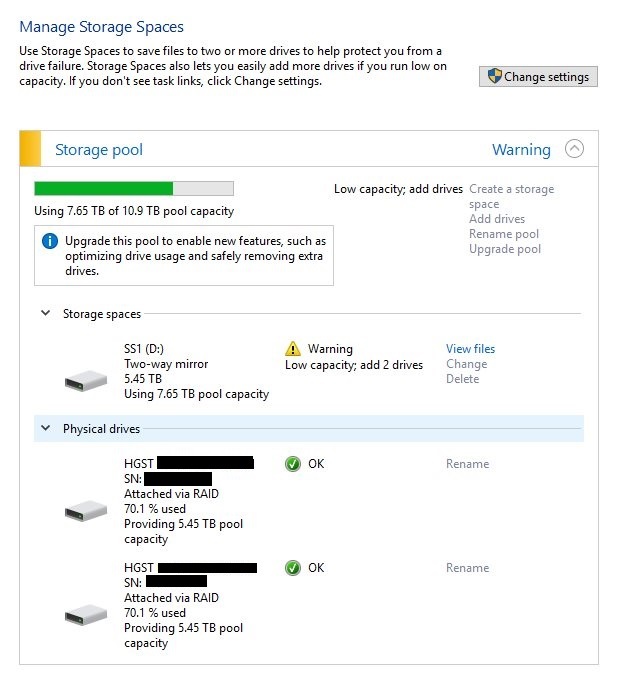 Win10 Storage Spaces - Missing capacity?